Essentially, Evernote is a cloud-stored notebook that can be accessed through a web browser or through an application on a mobile device. Because the information is stored in the cloud, it is synced between all of your devices, making it possible to access whatever you have stored there from virtually any device with Internet access. While notes and notebooks are a central function of Evernote, it actually makes it possible to do a wide range of things, including storing files, collecting research materials, managing projects, and much more. While there are many services that offer this ability, Evernote has long been a favorite (it first launched back in 2008) among productivity gurus (perhaps because it’s easily integrated into many of the leading productivity methodologies, including GTD). While it might not be the perfect fit for every user or every situation, because it can have a wide range of applications, it’s worth giving a try if you’re looking for a way to manage your digital ephemera and consolidate some of your apps into a single, multi-function tool. To get started with Evernote, you’ll simply need to navigate to the Evernote website and create an account (start by choosing “Sign Up for Free” after entering your email and a password of your choice). With a free account, you can upload 60 MB of new data each month. For most people, this will be more than enough, but if you need more, paid accounts are available. Evernote also provides apps for your desktop and browser, but you don’t necessarily need them to get started. Once you set up an account, you will also want to download the app on any device (for iOS and Android) you plan using it through, as this is the easiest way to access your information when not on a desktop or laptop. Take Notes: To create a new note, you (unsurprisingly) click “new note” which is the plus sign at the top of the menu on the left. Notes in Evernote work pretty much like typing in a word processor, though you can also take notes in audio format if that’s more of your style. Make a To-Do List: Within the notes section is the ability to create a to-do list. Go into a note and select checkbox from the top menu. Then you can add as many or as few items as you’d like to a to-list. Organize Your Stuff: One of the most powerful parts of Evernote is the ability to organize your notes using keywords. To add a keyword to a note, click on “tag” in the note. You can give each notes several tags, allowing you to easily file it under different topics where it might go. Notes are then searchable by tag, or if there are things you use often, you can add them to your shortcuts for easy access. Evernote also allows for two levels of organization within notes. Notes can be grouped together inside notebooks and notebooks can be combined into a stack. This is another way to keep related notes organized in a way that makes it easy to go back and find what you need. Set Reminders: Evernote also offers a reminder function which can help you stay on track with whatever you’ve got stored in your notebooks. To set a reminder, go into a note and click on the alarm clock symbol. You can use this as a way to mark priority tasks, or to have Evernote send you reminders later. Clip Articles from the Web: Evernote Web Clipper is a tool that you’ll want to get really familiar with if you want to really get into using Evernote. This browser extension makes it simple to save URLs, pictures, and text from any web page. It’s great for research, class discussion ideas, or just your own personal reading lists. Once you clip a URL, it’s saved in Evernote as a new note, and can be organized just like any other note. Save Photos: On a mobile device, you can easily take photos and add them to new or existing notes (and tag them to keep them organized). Cooler, perhaps, is the ability to take a photos of a text document and convert it into searchable text. This has numerous applications in everything from research material to keeping track of business cards. All of this is great, but what makes Evernote stand out from other notebook like apps on the market? One thing is the App Center. It features hundreds of other apps that use the Evernote API, everything from productivity tools that manage your tasks to mindmapping and brainstorming tools that seem a natural next step for integration with Evernote, making it simple to switch from app to app while keeping all of your information stored in one accessible place. 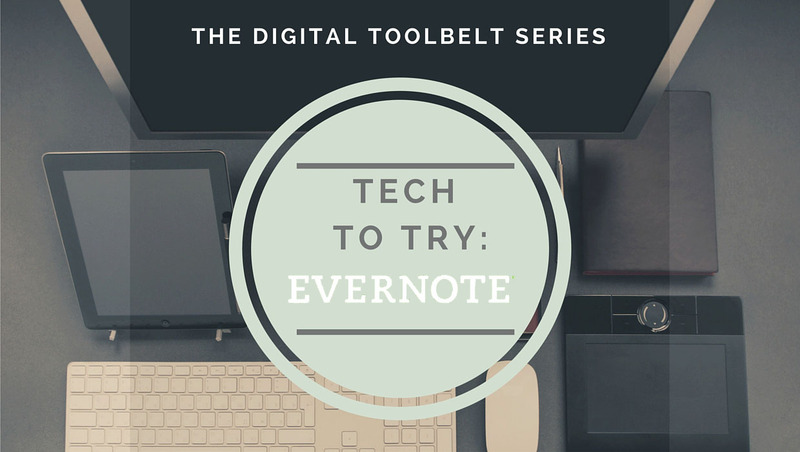 Evernote is a widely beloved app, in part because it’s so powerful. But there are so many ways to use it, it may not be clear just how it might be useful in an educational setting. Here are a few places where it can come in handy. Lesson Planning: By putting your lesson plans into Evernote, you can organize by unit or by class (or both) as well as integrate them easily with interesting articles, ideas for future assignments, photos, or student work. You can also create a public notebook in Evernote, which can be a place to drop any material you think students might be interested in reading, brainstorm with students collaboratively, or even ask them to submit certain assignments. Basic Documents: Any templates you use for grading or teaching your students can be stored in Evernote. As can any assignments, handouts, or other things you use again and again throughout the school year. This makes it so that you’ll never be without them, even if a student needs them sent on the fly while you only have your mobile device handy. You can also use it for keeping track of professional information like meeting notes, policies, and schedules. Research: Whether you’re pulling together things to finally finish your doctoral dissertation, or are working on new research in your field of expertise, Evernote is an incredibly powerful tool for staying organized and on task. It allows you to easily pull together notes, resources, books, photos, data, interviews, or anything else you’re using. Lectures: Because things can be stored in Evernote in a wide range of file types, you can organize your lectures, whether they be video, audio, or written. You can easily go back and see what you shared on each day, or even forward these documents on to students who may have missed class. You can also take pictures of a whiteboard you’ve used in your online class for future reference, making it possible to record how you’re teaching a subject or where students have questions from semester to semester. Professional Development: Any time you attend a conference or training you can use Evernote to store things you found interesting or enlightening. Examples include links to articles or resources, instruction videos, business cards from colleagues, notes from seminars, checklists of things to look into when you return, or just ideas on how to improve your courses. Not every instructor will find Evernote to be the ideal solution for organizing their academic ephemera, but with loads of functions, easy searchability, and the ability to interface with a wide range of other applications, it’s certainly a good place to start if you’re in need of a cloud-based solution for filing away all of your research and ideas. This entry was posted in Guides and tagged Ed Tech, Evernote, Productivity, Professors. Bookmark the permalink.